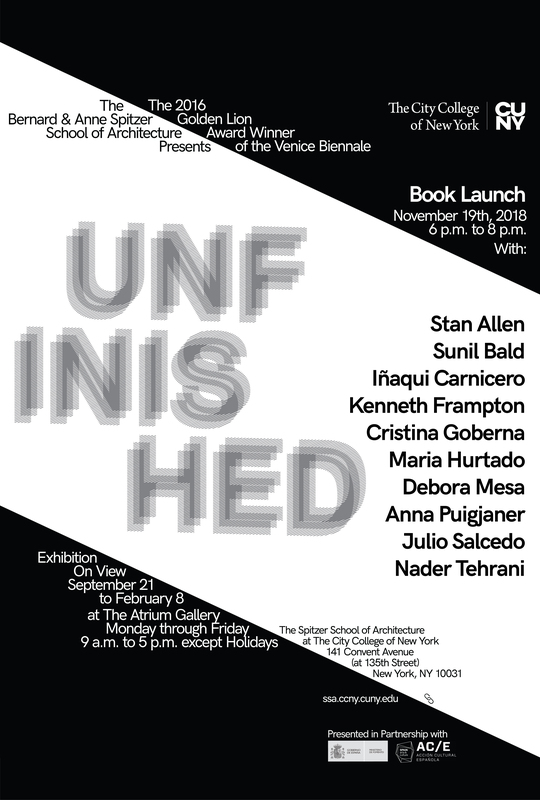 We would like to cordially invite you to join us celebrate UNFINISHED: A Spitzer School of Architecture / CCNY exhibition of the 2016 Golden Lion Award for La Biennale di Venezia . On November 19th at 6 pm, we will host an event to launch the publication associated with the exhibition. The exhibition will be on view until February 8th 2019. Please kindly see attached image for invite. We are pleased to present “Unfinished” – The Spanish Pavilion entry and Golden Lion Award for 2016 Venice Architecture Biennale. It is a most timely and poignant exhibition that exposes the reciprocity and dependency of design to an economic, societal and environmentally layered context. “Unfinished” does so by the curated presentation of the modern ruins resultant in the aftermath of the global financial crises of 2008. A crisis that was particular crippling and devastating to a Spanish economy largely sustained by real state speculation, and that spun other social, and environmental crises. The curators of “Unfinished”, lñaqui Carnicero and Carlos Quintans, reflect on these modern ruins by a tightly choreographed yet kaleidoscopic inventory of structures, photographs and video interviews. Through these multifaceted documentation, we are able to draw a new understanding of the types of effects and influences that define our environment and practices, particularly as they may be affected by underpinning conditions, e.g. financial speculation. It is here that exhibition also posits an optimistic outlook: As complement to the modern ruins depiction, the curators have assembled a set of extraordinary projects that define new reflexive design strategies as adaptations and critiques of these crises. The show is a reckoning of negative operative nature of the design practices as unmediated tools of speculation. It is also a demonstration of the fragility of architecture; and ultimately, it is a a validation of innovative and engaged practices that have parsed through the wreckage to find a voice.